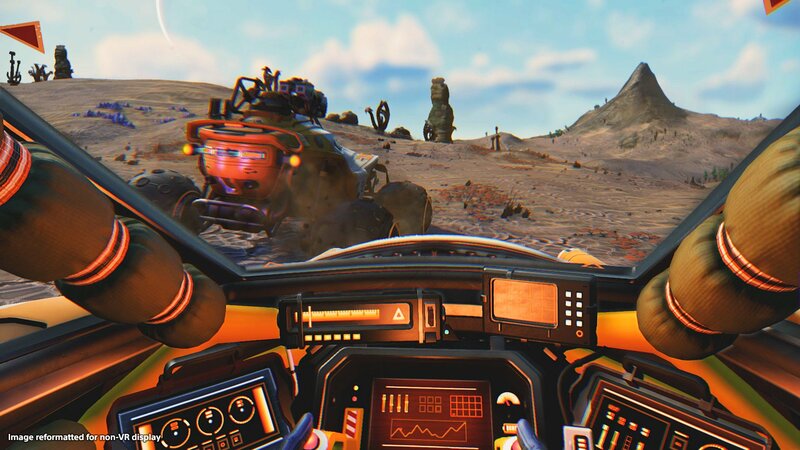 No Man's Sky: Beyond is the next chapter in the space exploration game's saga and will be introducing VR functionality. We got a chance to experience it hands-on. 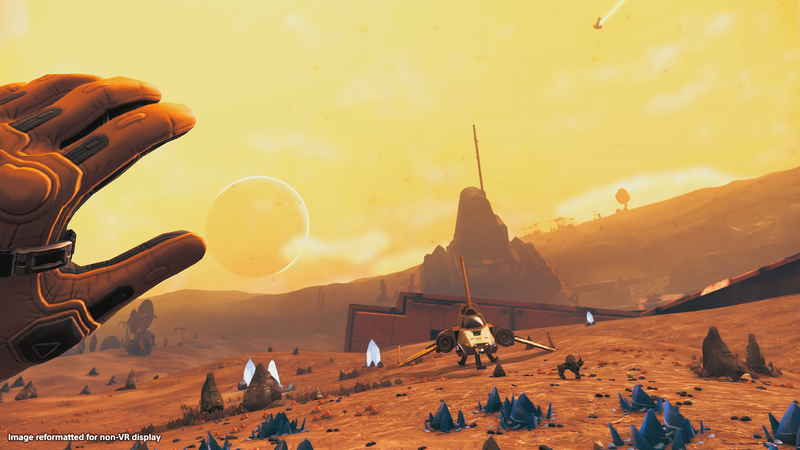 While No Man’s Sky may have gotten off to a bit of a rocky start, over the last few years it has grown and expanded its content in many notable ways. Now, the team at Hello Games are ready to head into a world that even they haven’t charted yet in No Man’s Sky next chapter, Beyond. The next chapter will bring several updates with it, but the most notable addition in No Man’s Sky: Beyond is probably the addition of PSVR compatibility. I was able to get a very brief hands-on demo with some of the upcoming VR features at a recent Sony event. When Beyond launches, PS4 owners with a PSVR and PS Move controllers will be able to experience No Man’s Sky in a whole new way. In VR mode, players will use teleportation mechanics instead of walking or floating around using a jetpack. Players will point and click their way around unexplored planets and space stations. Stats like oxygen and health can be checked by looking at a monitor on the left wrist. All the tools that No Man’s Sky players should be familiar with are all there but will be accessed in new ways. To scan a newfound plant or lifeform, players will hold their PS Move controller up to the side of their head like they’re pushing a visor button. Blasters can be procured from a holster on the right hip and there are switches on the blaster itself used to activate its various functions like mining or terraforming. The real star of the demo, for me at least, was taking a spin in No Man’s Sky: Beyond’s vehicles. Driving and flying are very intuitive in-game. To enter a vehicle you just teleport up to it, lift the hatch with an upswing gesture, and you’re suddenly behind the wheel. Steering an ATV involved manning a two-handed wheel with a few buttons on it, while the spaceship involved a joystick and throttle setup. While I didn’t get to spend that much time exploring the land I really enjoyed piloting both. The ATV reminded me of riding dune buggies in the Nevada desert and flying into space and traversing the cosmos is just flat-out breathtaking in VR. When No Man’s Sky first came out I think I personally enjoyed it more than many other players at the time. I just really appreciated the casual pace I could go at and the feeling of vastness and isolation it instilled in me. No Man’s Sky: Beyond is feeling like it could instill a similar sensation in me, but I’m going to reserve my full criticism for when the update launches. 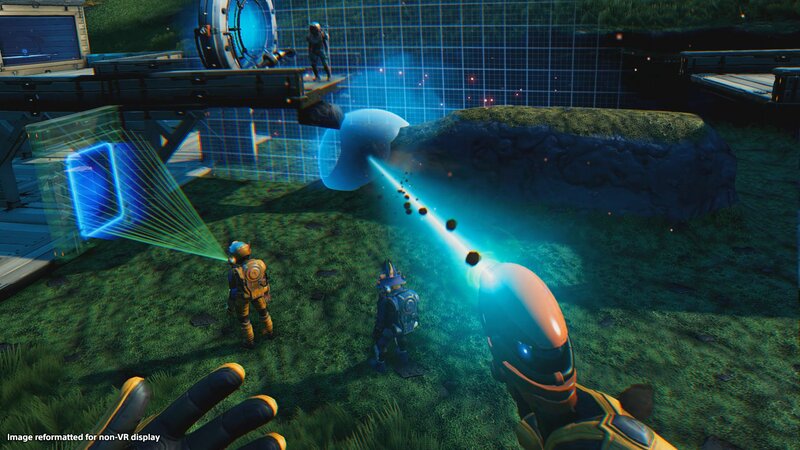 The No Man’s Sky: Beyond update is set to launch sometime this Summer, 2019. Players will need a PS4, PSVR, and PS Move controllers to experience it in VR. Nothing but huge respect for these guys after flubbing it so bad out of the gate, dealing with the aftermath and then stepping up and doing what they’ve done with this game. This is what professionals do. It has been noted elsewhere that teleportation isn't the only method for moving around in NMS VR. I assume it is the preferred method though.